I loved this doggy's face, the calm yet alert look in his eyes! Every dog is different, I've painted and drawn hundreds of golden retrievers and each one's personality shone right through their photos. That's what I try my best to capture! When someone orders a pet portrait from me, I like to ask about the pet's personality. Shy? Goofy? Smug? Smart? Calm? It might sound silly, but to me, I truly believe I get a better likeness when I know all about the pet. Especially when I paint their eyes, then they are looking right back at me! I'm artist Robin Zebley, thanks for visiting my site! Feel free to contact me with questions or comments. Robin. Want to see more? 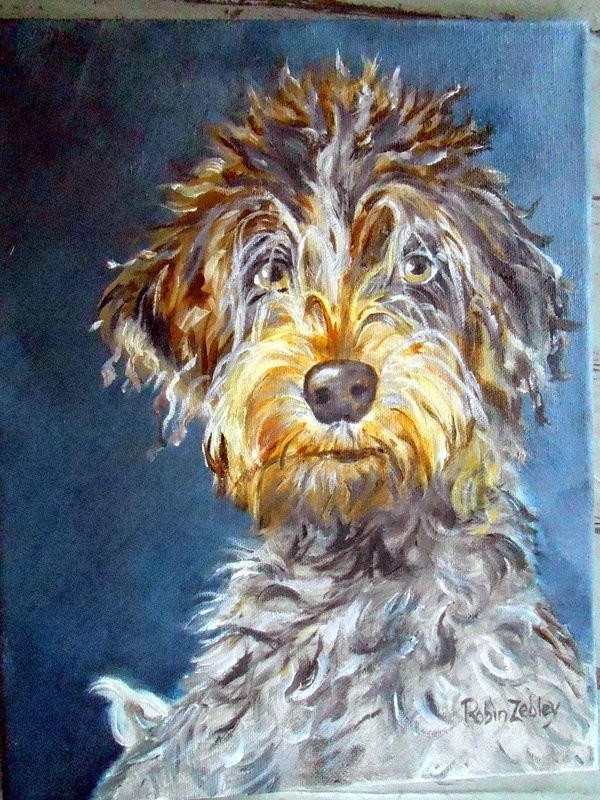 Here's more from my portfolio of painted pet portraits.